From a tunnel of inflatable swimming pool toys - to hotel rooms made of giant concrete tubes - take a look at 12 striking structures that celebrate small-scale 21st Century architecture. "I wanted to show how scale really is not a barrier to creativity. In fact, probably the inverse is true," says Rebecca Roke, author of a new book Nanotecture: Tiny Built Things. "Small architecture can be highly expressive, experimental and accessible." Take a look at 11 other examples of "nanotecture" - from the small, to the not-so-small. "This is a charming idea of repurposing something - namely concrete storm drains," says Roke of these hotel rooms. The structures were meant to be a simple and cost effective way of creating backpackers' accommodation - she explains - but because of their design ingenuity, they have proved popular with other travellers too. "This is about providing people with a space they can call home, when they don't have one," says Roke. 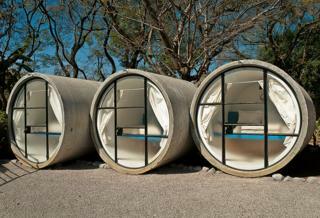 These mobile home designs by Winfried Baumann provide the basic necessities of shelter - with the aim of helping the urban homeless, and those forced from their homes by natural disasters. They are lightweight, transportable and equipped with emergency supplies - including a first aid kit and a retractable padded bed. During the chilly Canadian winters, the lifeguard stations on Toronto's Woodbine Beach are not used - and so this project breathed new life into them when it was cold. 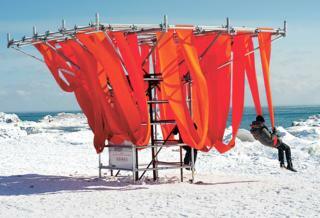 "A new structure was built around the existing one, and very simple looped orange canvas hanged down," says Roke. "People could sit or swing. It's simple and colourful." 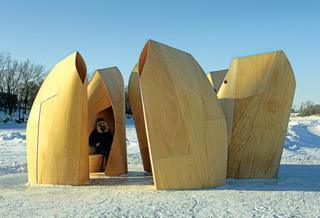 Staying in Canada, these six plywood shelters provided shelter for ice skaters on Winnipeg's Red and Assiniboine rivers. "Each pod was for one or two people, and they were designed to block the wind," says Roke. "I like the ingenuity here. The light shafts at the top of each one capture the light." 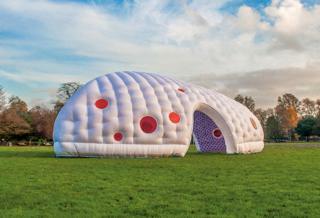 This moveable, inflatable, nylon folly can be found in the Essex countryside. 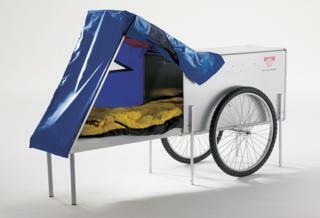 Designed for a local council project, local residents can hold meetings inside. "It's bright engaging and playful - with the shape, like a bug or butterfly, drawn from the imagination of children who responded to the architects' interviews," says Roke. This impressive shed/garden room was conceived in the spirit of Henry David Thoreau's novel Walden: Or, Life in the Woods. Clad in vertical strips of timber, it has special niches cut out on each side for garden tools. "It's an enjoyable, innovative and moveable space," say Roke, "and there is a sundeck on the roof you can climb on to." "This two-bedroom house and studio, on a suburban street in Melbourne, is basically giving a cheery greeting to its neighbours," says Roke. "The architects wanted to create something dynamic, in contrast to the Victorian buildings around it." "There is a small entrance on the right, and a tiny slice window to give people a glimpse of what might be behind." "The mirroring is a fantastic device to camouflage the room and to multiply the appearance of foliage around," says Roke. 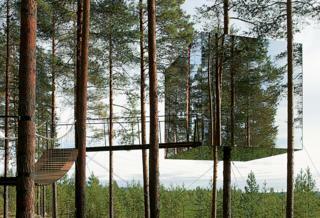 The suspended box in the woods is part of the eco-tourist Tree Hotel complex in Sweden. 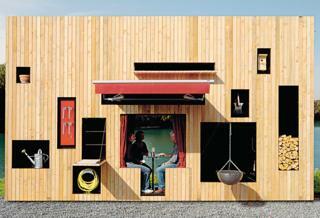 "Inside there is a bedroom for two - but also a rooftop space to enjoy the scenery. It has quite the camping adventure feel to it." 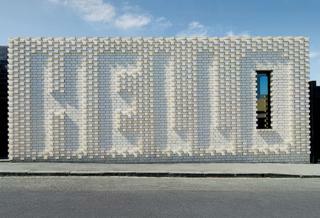 "Toyo Ito deconstructed the idea of a simple box, using angles and cuts. It looks random, but it is very precise." 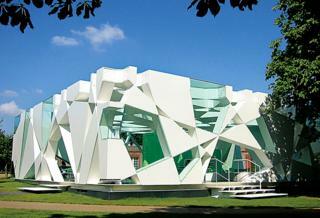 Ito's structure in London - one of the Serpentine Gallery's annual summer pavilions - was only temporary. "But he really re-imagined the idea of folly in the English landscape tradition," says Roke. 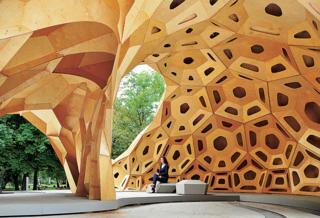 Another experimental folly - this time in Germany - and arguably, not that small. "Created by university students, this was designed using experimental computer design tools," says Roke. "With the shapes based on the structure of sand dollars [flattened, burrowing sea urchins]." 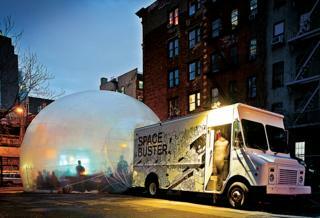 "It's a van with a bubble!" This inflatable public space emerges from the back of a truck and can fit about 80 people inside for public meetings, dinners and even concerts. "Here it can be seen in New York, but it is used in other parts of the world too," says Roke. "All the bubble equipment can be stored inside the van - it's so simple." Top image: "PlayLand" by Like Architects - Paredes de Coura, Portugal (2014). 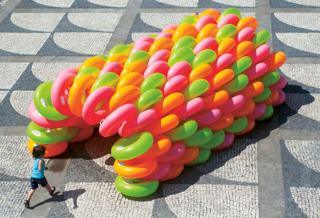 Nanotecture: Tiny Built Things, by Rebecca Roke is published by Phaidon.